Regardless if you are a new start up business or a well-established company a professionally designed business card is essential. Business cards are cards containing business information about a company or individual. They are shared during formal introductions as a memory aid. A business card normally includes a name, company or business affiliation (usually with a logo) and contact information such as street addresses, telephone number(s), fax number, e-mail addresses and website. Business cards should include social media addresses such as Facebook, LinkedIn and Twitter. DLM Marketing has a team of professional designers that can design a business card that will help you and your business standout from your competitors. 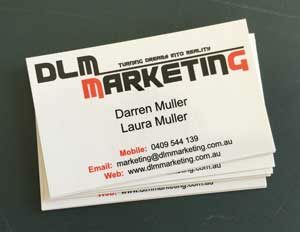 We can also assist in having your business card printed if required.